Photo: A woman takes her children to shelter as an army member tries to help them, during a shooting at a military parade in Ahvaz marking the 38th anniversary of Iraq's 1980 invasion of Iran (AP). Iran has been hit by yet another terrorist attack. 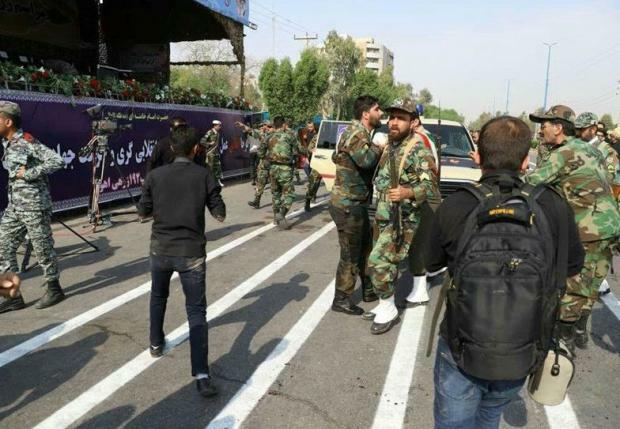 At least 29 people were killed in the southwestern city of Ahvaz when gunmen opened fire on a crowd watching a military parade on Iran's equivalent of Memorial Day. But unlike previous terror attacks, this one may spark a much larger regional conflagration - involving not just regional rivals Saudi Arabia and Iran, but also the United States. In fact, it may have been designed to trigger just that. The terrorist attack, which was first claimed by an Arab separatist group with alleged connections to Saudi Arabia, the Ahvaz National Resistance, did not occur in a vacuum. Iran's regional rivals, particularly Saudi Arabia and the UAE, have increasingly taken their decades-long behind-the-scenes pressure on the US to bomb Iran into the open. Only a year ago, Saudi Crown Prince Mohammed bin Salman explained in an interview that Saudi Arabia would take the fight to "inside Iran". "We won't wait for the battle to be in Saudi Arabia," he said. "Instead, we will work so that the battle is for them in Iran." His statement was widely interpreted as a sign that Riyadh would dramatically escalate tensions with Iran and intensify its support for various armed groups opposing the government in Tehran. Abdulkhaleq Abdulla, an adviser to the Abu Dhabi government, justified the Ahvaz attack on Twitter, arguing that it wasn't a terrorist attack and that "moving the battle to the Iranian side is a declared option". Attacks of this kind, he ominously warned, "will increase during the next phase". If the terrorist attack in Ahvaz was part of a larger Saudi and UAE escalation in Iran, their goal is likely to goad Iran to retaliate and then use Tehran's reaction to spark a larger war and force the US to enter since Riyadh and Abu Dhabi likely cannot take on Iran militarily alone (indeed, after spending roughly $6bn a month, they have failed to defeat the Houthi guerillas in Yemen). If so, the terrorist attack is as much about trapping Iran into war as it is to trap the US into a war of choice. As former secretary of defense Bob Gates said in 2010, the Saudis "want to fight the Iranians to the last American". The Ahvaz attack comes only one day after Secretary of State Mike Pompeo issued a strong threat to Iran, declaring it would be held "accountable" if there were any more attacks on US consulates in Iraq. This pattern of bellicose statements and actions fits well with a memo National Security Adviser John Bolton - who has a history of manipulating intelligence in order to drag the US into war - wrote in August 2017, before he joined the Trump team. The memo details how the US should coordinate with Israel and Saudi Arabia to build support - domestically and internationally - for a withdrawal from the Iran nuclear deal and a much more aggressive policy on Iran. It specifically mentions "providing assistance" to Khuzestan Arabs - the minority group in Iran that the Ahvazi attack perpetrators claim to represent. Bolton also argues that the Trump administration should demand payment from Iran for its non-existing role in the 9/11 September attacks while disingenuously offering Iran dialogue amid a policy of confrontation. The Trump administration's Iran policy is following the Bolton memo almost point by point. The plea to provide assistance to Khuzestani separatists is particularly damning. This raises legitimate suspicions that if the terror attack has Saudi and UAE fingerprints on it, it may not be so much an attempt by them to drag the US into war as Trump operating in the driver’s seat. Trita Parsi is founder and president of the National Iranian American Council and an expert on US-Iranian relations, Iranian foreign politics, and the geopolitics of the Middle East. He is author of Losing an Enemy - Obama, Iran and the Triumph of Diplomacy; A Single Roll of the Dice - Obama's Diplomacy with Iran; and Treacherous Alliance: The Secret Dealings of Israel, Iran, and the United States.